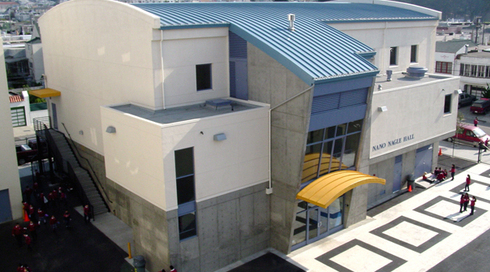 School of Epiphany Gymnasium — PARADIGM Structural Engineers, Inc. This K-8 school was founded in 1938 and is currently the largest school in the Archdiocese. In order to accommodate a growing student population, the Nano Nagle Building (named after the Presentation Sisters’ Foundress) is sited on the former parking lot and playground. Designed by HKIT, the new building is a 13,398 square-foot, 2-story concrete and steel building with curved roof trusses and metal stud and plywood infill walls, supported on a concrete podium. The first story podium, housing the classrooms, was composed of a 1' -6" thick waffle slab supported on interior concrete columns and perimeter concrete bearing walls. The ground floor contains a new science lab, the library and a classroom. The gymnasium is located on the second floor. The new gym is a great improvement, replacing the cramped facility adjacent to the church. A sound barrier is installed between the two stories so the gym activities won’t disturb the students in the classroom, science lab or library.